I’m writing this coming Storm Sunday ahead of time as I will be visiting the woods of Tennessee for a week and will not have access to cell phones, computers and other technological devices (No Twitter? Oh noes!) 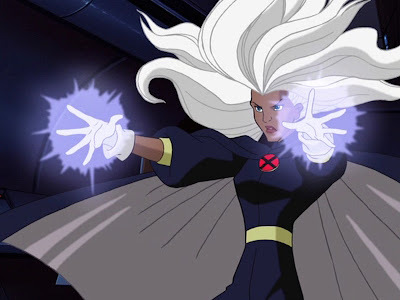 This time, instead of looking at a specific artist’s rendition of Ororo, we’re going to look at a few images of Storm from animation. Storm was a main character in the X-Men cartoon from the 90’s and it was a Saturday morning staple for me and my rave-tastic friends. We were so geeky that we even called ourselves the X-Squad and took X-Men codenames for when we went to the clubs/parties. This was the beginning of me actually going by Storm as my name (Before I legally changed it) and since we had no Cyclops or Professor Xavier (Thank the Goddess for small favors) I “led” the team. We liked nothing better after a Friday night of partying than to watch our favorite characters on the small screen. We were usually still up anyway, a big pile of folks in somebody’s living room being all around hyper and worn out at the same time. I remember everyone loving Beast and hating on Jean. We even had a Rocky Horror-style interaction with the series and eventually we designed a drinking game on the show (Every time Rogue and Storm get shot out of the sky, drink. Every time Scott yells, “Jean!” Drink. Everytime Jubilee says, “I’m just a kid!” Drink. I’m having a hard time remembering the rest at the moment, but it got to be quite elaborate especially after we started buying copies of the show on VHS). I wish this series was collected on DVD. I’ve got all of Storm’s lines memorized from the episode of “Captive Hearts” where she fights Callisto for leadership of the Morlocks (But instead of a knife like she used in the comics, Ororo and Cal use big sticks with padded ends like old school American Gladiators). Ah, good times. Anyway, Storm’s costume is white for the first time on this cartoon. Up ’til then she had always worn black in the comics. This costume is based on Jim Lee’s design of Storm which is memorable from his tenure on the series (Including the first issue of the adjectiveless X-Men title). Jim drew Storm in black but he really highlighted the reflection of light on the black leather. I suppose this is how Storm ended up wearing white in the cartoon, but this is all conjecture. 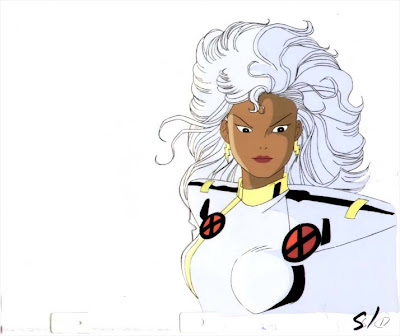 I have to say, though, I really don’t like Storm’s wearing a white costume with her white hair (Especially as large as it was in this version). It doesn’t give her enough contrast visually. I did like her voice actors. They gave Ororo a real sense of authority which sometimes bordered on the ridiculous, but all the characters in this series suffered from the same bombastic writing. It was part of the fun. Here’s a dramatic shot of Storm from X-Men: Evolution. 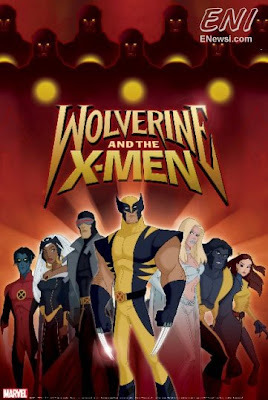 I liked how Storm and Wolvie were placed as teachers alongside Professor Xavier for this cartoon (Even though that meant sometimes we didn’t see much of Storm because the show focused mostly on the kids and Ororo is meant to be a bit older than they are. She even had a nephew named Spyke in attendance at Xavier’s. I hated him. I was ticked that Storm–an orphan–even had relatives and his blond hair and knock off Marrow power set was uninteresting to me.). Although sleek and streamlined, Storm’s costume is a bit bland. Great to see her back in black, but white gloves? Blah. And that waist is too tiny. The worst insult was her action figure which although nicely sculpted had an action feature so you could shoot water from a pump in her back through her arm out of her a hole in her hand. Dumb with a capital D-U-M-B. The great thing, however, is that this series (which won two Emmys) gave audiences a strong, capable and powerful Storm. It should have been required viewing for Halle Berry before she tried to fill Ororo’s thigh boots in the movies. Here’s the only promo art for the upcoming Wolverine & The X-Men cartoon. Why Wolverine needs to be top dog, er, wolverine, is beyond me. It’s cool that Emma Frost and Kitty Pryde made the list of characters featured. Actually, I like the entire roster except for Cyclops, but even I have to admit that including Scott creates great drama what with his penchant for following and barking orders. Besides, the obvious Wolvie/Cyke dustups, I hope that Scott and Emma’s relationship translates well to the animated screen. But enough of all those guys. Let’s look at Storm’s outfit, shall we? I think overall it looks nice. The tiara is a bit exaggerated, but the design stays pretty true to the Alan Davis redesign (Except for those dotted lines). I’ve never like the sash belt, but I like how Ororo’s hair is long and flowing. She looks a bit reserved though. Her posture could use some toughening up. Give the girl a diva stance, folks! Why she isn’t leading this version of the team (At least co-leading with Scott would be a step in the right direction) just staggers my mind. I know Wolverine is a cash cow, but lets worship some new idols already! That’s it for this Storm Sunday! I’ll be back in the so-called civilized world Tuesday after next and will check in with you all then! I think it’s awesome that you love the white costume so much and are searching for your very own version of that costume! I did some of my own searching and didn’t find any white costumes for Storm (although there appear to be a lot of statues of her from that era!). My advice is to find yourself a competent seamstress who can make you a white bodysuit and cape to fit your bodytype and make the red and black X ‘s out of air dry clay. That still leaves you the challenge of the shoulder pads, but some foam and fabric might be the ticket. Also, a well made costume is worth the coins as you’ll have a Storm costume whenever you want! Hope that helps and Good Luck with your search for embodying the Mistress of the Elements!